“Holds many surprises for the reader who has seen the Cuban reality . . . only through the distorting prism of propaganda.” -The New York Times Book Review, 1967On December 31, 1958, Lee Lockwood, then a young photojournalist, went to Cuba to cover what looked to be the end of Batista’s regime. He arrived the day before Fidel Castro took power and spent a week canvassing the island before finding the victorious leader. Castro immediately took to Lockwood and over the next decade invited him back many times, granting him special access to his inner circle and free rein to explore the island without the usual restrictions imposed upon American journalists.In 1965, Castro granted Lockwood a rare, in-depth interview but then missed appointment after appointment. 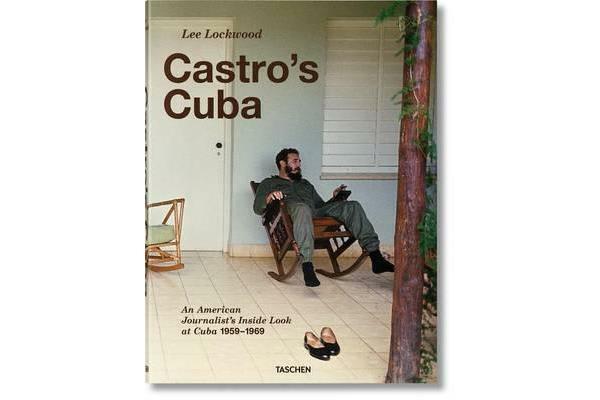 Days turned into weeks turned into three interminable months, as Lockwood, like many journalists before and since, waited for Castro. But it was worth the anticipation, climaxing in a marathon seven-day interview that covered everything from racial issues in America to the Cuban Missile Crisis. It remains to this day one of the most penetrating portraits of the Cuban leader.Originally published in 1967, Lockwood’s interviews and observations are now republished by TASCHEN alongside hundreds of photographs covering both the weeks Lockwood spent traveling with Castro and the years he documented Cuba’s transformation throughout the ’60s. From military encampments in the Sierra Maestra mountains to Havana street life and political rallies, many of these color images have never been published before. A foreword and afterword by Latin America expert Saul Landau contextualize Lockwood’s work at a moment in history when U.S.-Cuba relations once again take center stage.